We were greeted with crystal blue water and the finest white sand we have stepped foot on. It felt like we had stepped onto our mother’s fine dining floor and needed to sweep up our foot prints from the deserted beach. As a travelling parent, you start to think and question the simplest things while travelling. Will there be a long flight, will there be a long drive after the flight, I hope the airport is nice so the kids can run around, basically, I hope the travel will be relatively easy? That said, with a four hour flight from Singapore with our 6 month old and 3 year old, we were very happy to have the Coco Bodu Hithi liaison greet us at the arrival gate. The reassuring smile made our troubles melt away and the ease of transfer from the departure lounge to the luxury boat transfer was a dream. After the easy and fun 45 min boat ride, we arrived at our destination, Coco Bodu Hithi, and what can I say, this is the Maldives, and we weren’t disappointed. 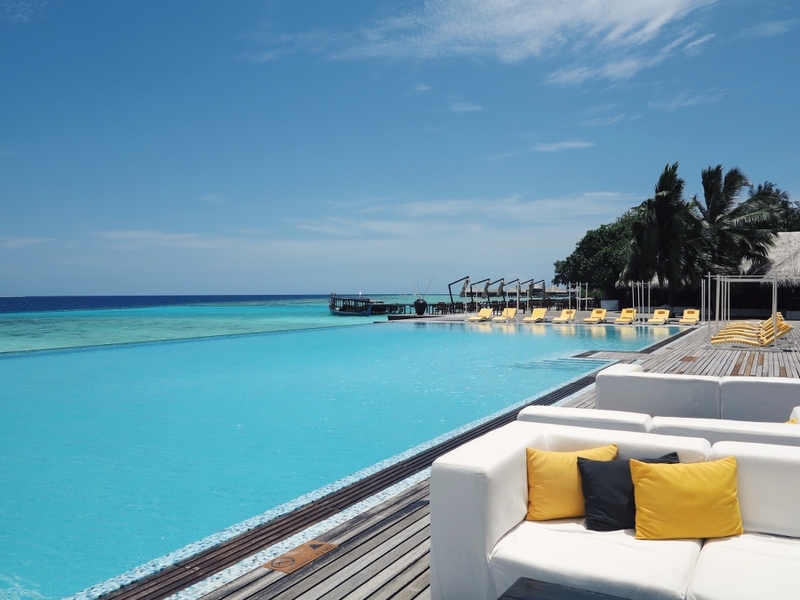 Coco Bodu Hithi has everything you have dreamed of, with 100 villas – a combination of seductive over-water villas and private jungle villas. 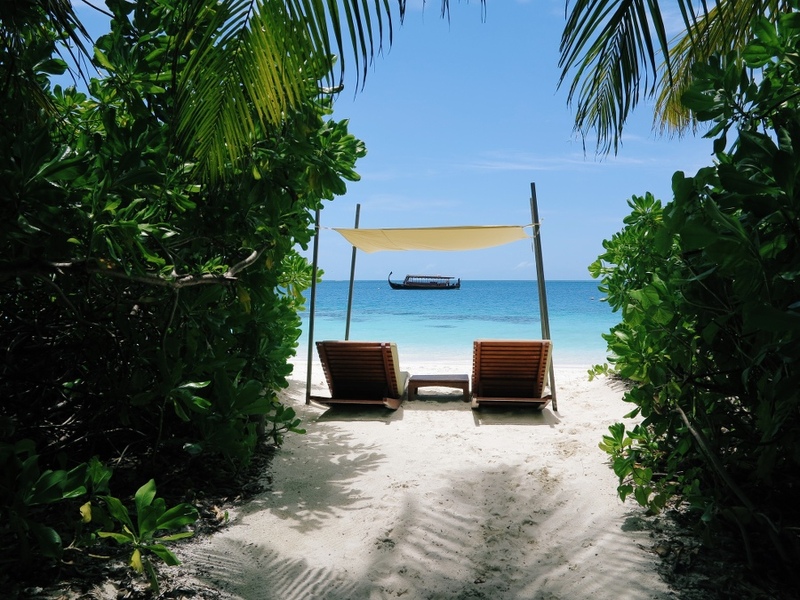 The accommodation was tropically dreamy with beautiful open designs allowing the salt air to tantalisingly tempt you to the water’s edge where we were greeted with crystal blue water and the finest white sand we have stepped foot on. It felt like we had stepped onto our mother’s fine dining floor and needed to sweep up our footprints from the deserted beach. 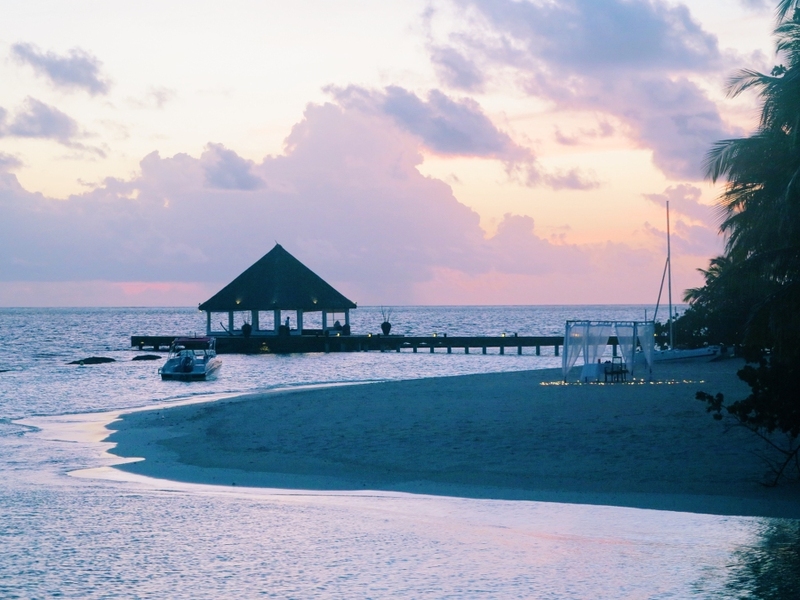 The resort with 360 degree ocean views is designed in such a way that even though it is busy, you feel as though you are the only one on the island. 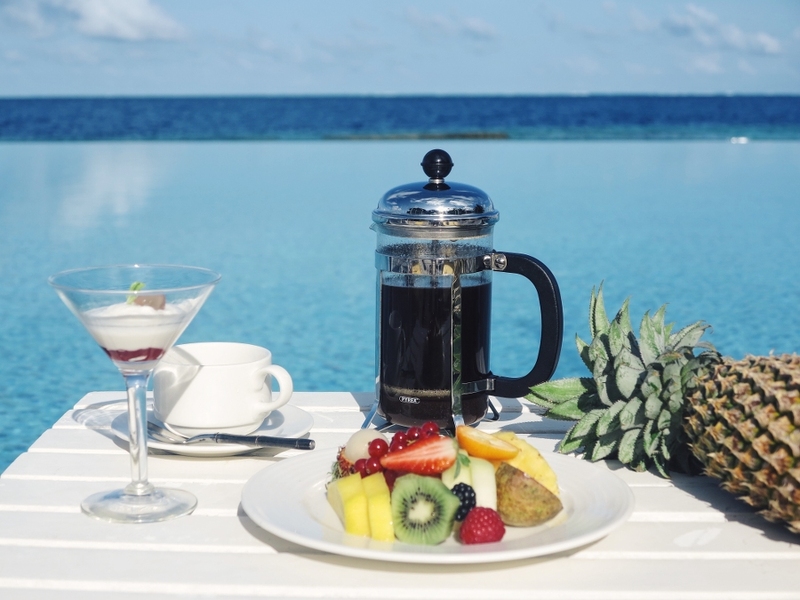 The island also has 6 restaurants to indulge in and is renowned for the most spectacular infinity pool in the Maldives. 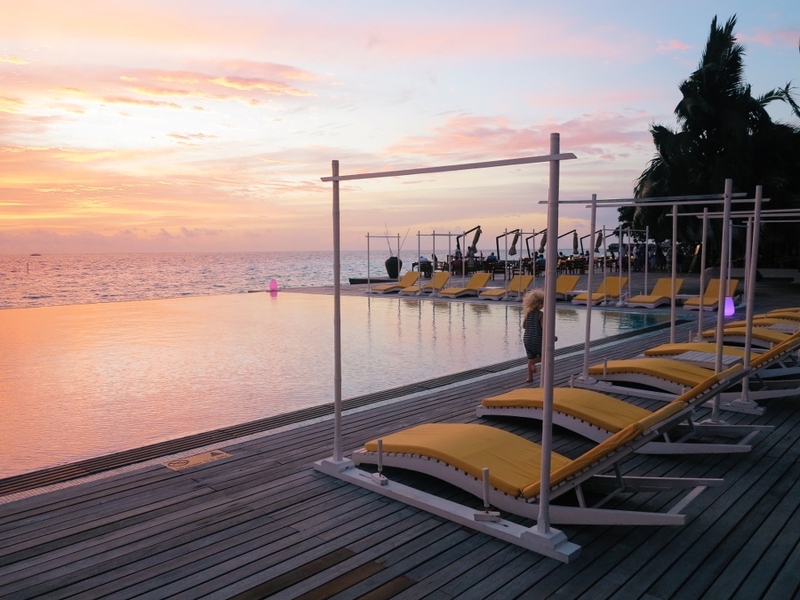 The large glittering glass pool in front of LATITUDE lounge bar rivals the ocean for the bluest blue, creating the very difficult choice of deciding whether to submerge yourself in the pool or sea. The pool also faces the afternoon setting sun, which lights up with every spectrum of the rainbow. We were able to capture the most magical sunset photos while relaxing to live music with a cocktail in hand. 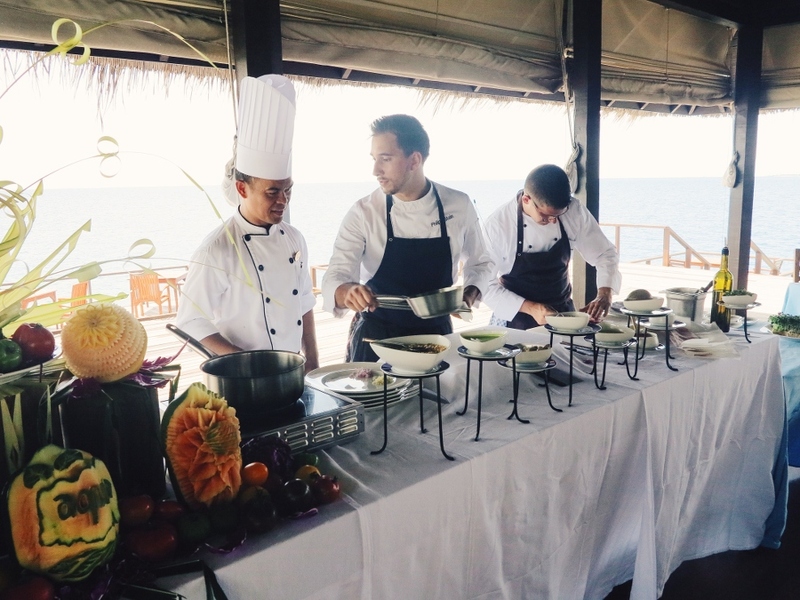 The breakfast buffet was delectable with a vast array of selections to satisfy even the strictest of food critics. The fresh fruits were especially good, coupled with delicious pastries & a good coffee to wake us up. 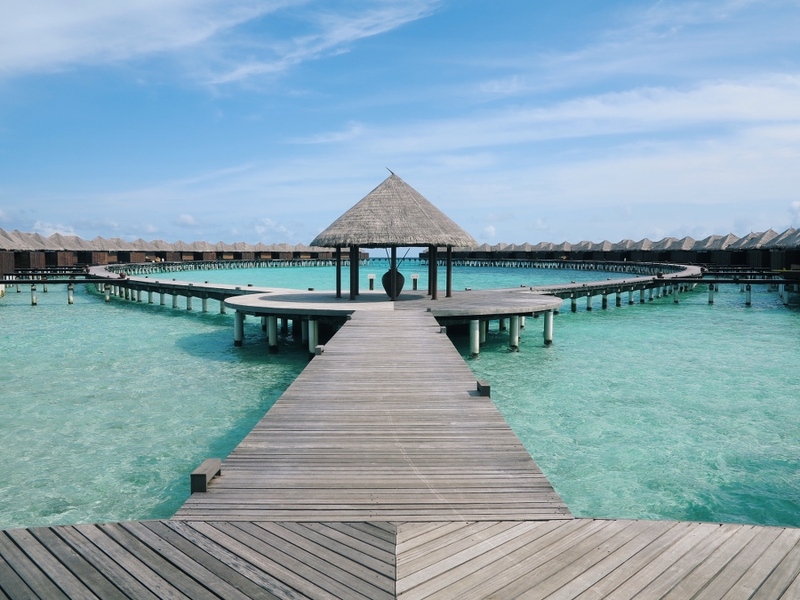 COCO BODU HITHI hosts two breakfast spots, so if the AIR buffet is not your style (however, with kids it was fantastic as there was no waiting for the food), then try their STARS restaurant which sits over the water and offers the best of the buffet selections a la carte. STARS was very tranquil over sitting the water & rarely busy, if you have plenty of time to start the day, then a breakfast while sitting over the lapping waves is definitely a great way to start. Our first night we chose to eat dinner at STARS restaurant, the same as the a la carte breakfast option. It was stunning, with the sound of the waves, a nice fresh breeze keeping us comfortable, tropical fish swimming in and out of the floodlights and a starry sky lit with a full moon. The waiter even set up a telescope for us to ponder deeper into the universe. And of course, the food was fantastic. We chose from the western menu, but there are dishes to appease all tastes from Chinese, Japanese, Korean to local Maldivian delights. And the seafood was as fresh as you could imagine, we think we even saw a fishing line being cast from the kitchen. Other dining options range from the expected (but very good) 5-star resort buffets in the main restaurant AIR, to fresh Japanese in TSUKI a smaller upstairs restaurant, to casual dining in the LATITUDE lounge with live music. 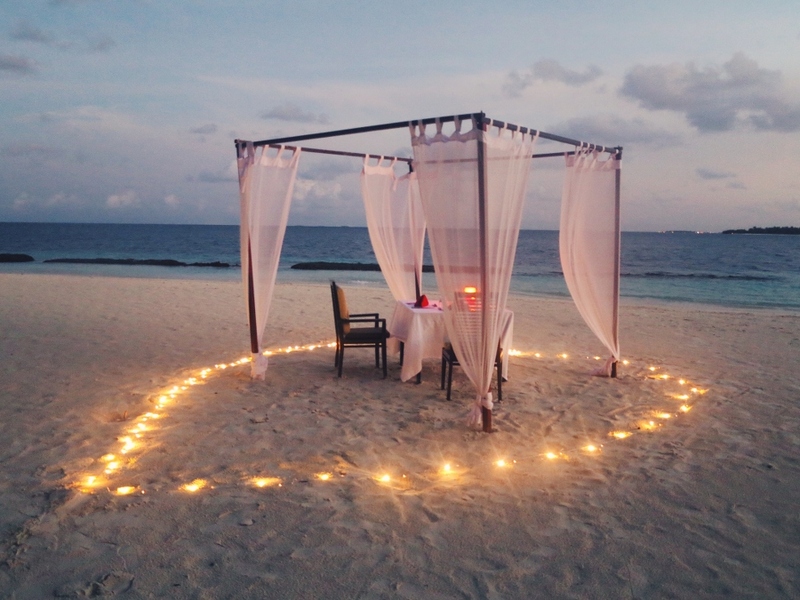 Guests can also enjoy the weekly BREEZE Seafood BBQ, request special romantic dinners in privacy on the beach or a meal while attempting to get closer to the sunset on a boat cruise. We were very spoilt to have Michelin star chef Philipp Stein from Germany, one of the youngest Michelin star recipients, visiting the resort during our stay and were lucky to experience his one-off degustation menu at AQUA restaurant – “Winner Best Luxury Seafood Restaurant in Maldives 2016” – and we can utter no other word than…incredible! The seafood selections of “Short Fried Tuna with Ratatouille Salad, Aioli, Basil and Garlic Chips” and “Curry of Rock Lobster with Paste Pierre, Mango, Cashew and Lemon Grass” were our two favourites of the seven carefully selected dishes. These were paired with fantastic wines from the French region and we were in a food fantasy. 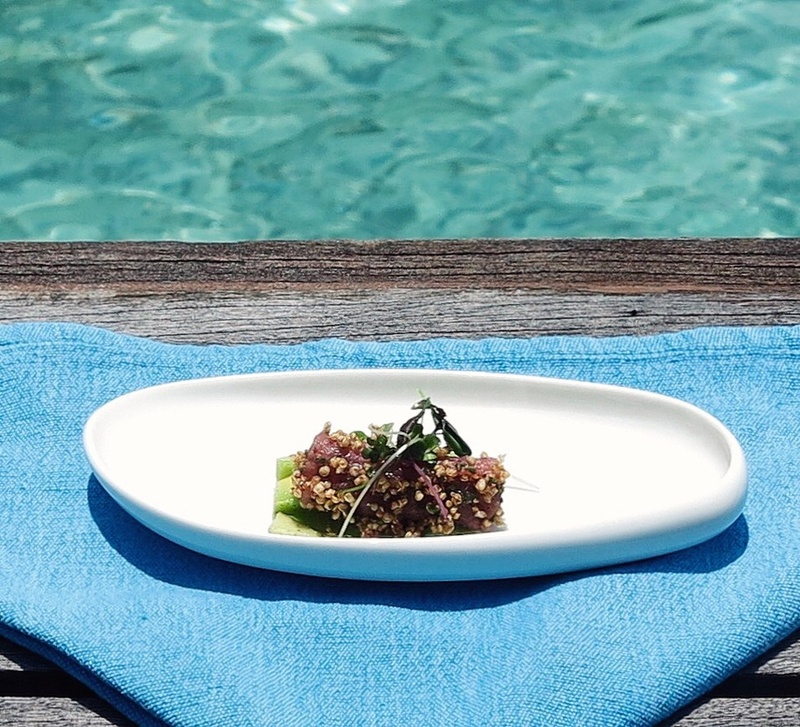 The next day we had a masterclass at AQUA with the great chef himself, and learned how to perfect his signature “Involtini Maldivian Tuna Tartar and popped Quinoa and Avocado Carpaccio.” It’s needless to say the masterpiece melted in our mouths with an explosion of flavours along with it! 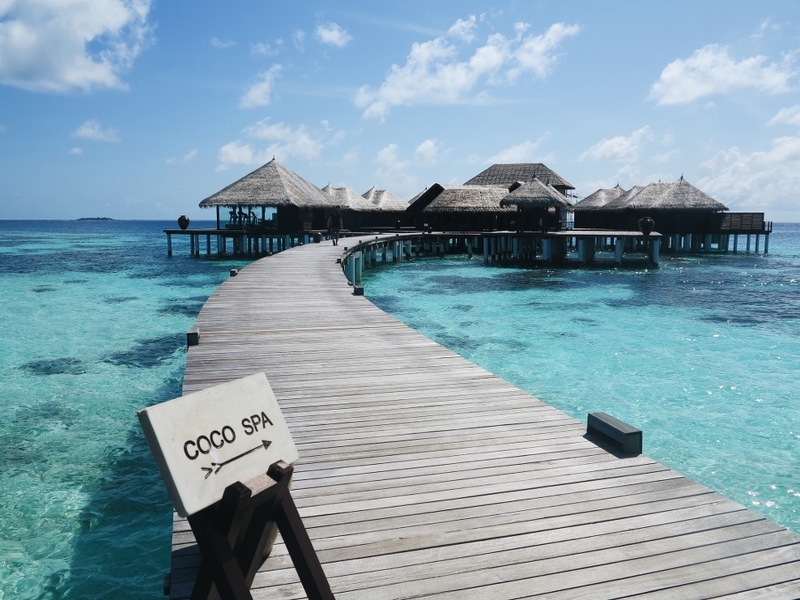 Spa settings don’t get much more spectacular, with its over-water entrance to the jewel of the resort – the COCO SPA. As if we’d just stepped into our palace and onto our throne, the staff gave us a royal welcome, including a refreshing drink and small form so we could outline our preferred pressure and any other preferences. 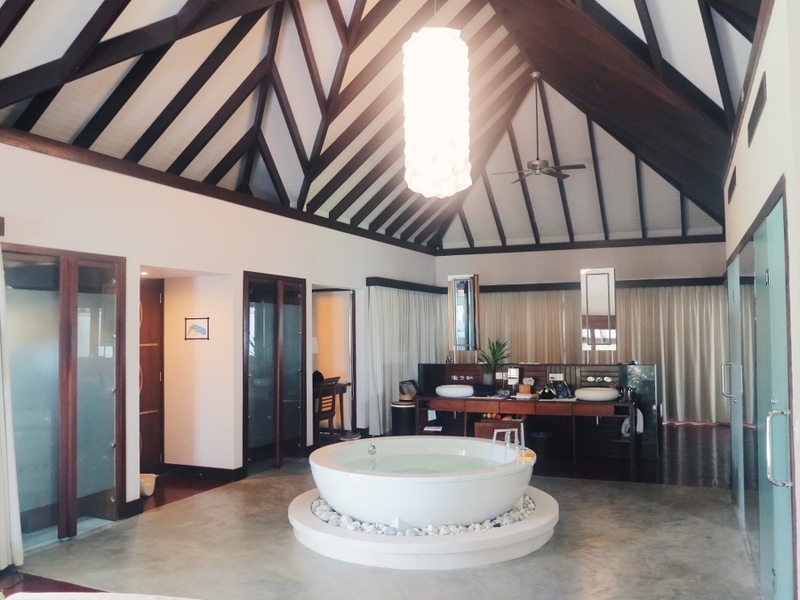 We were then lead through the spa and into the most idyllic room for our treatment, overlooking a private infinity pool. We definitely floated to heaven and back during our 1-hour Balinese massage followed by a dip in the intimate over-water pool. After rolling out of the restaurants each morning, it was time to start the day and select activities that would suit us and the kids. Unfortunately, we skipped the scuba diving trial as it wasn’t 3 year old friendly, the sailing wasn’t our cup of tea as the winds seemed quite strong further out to sea. 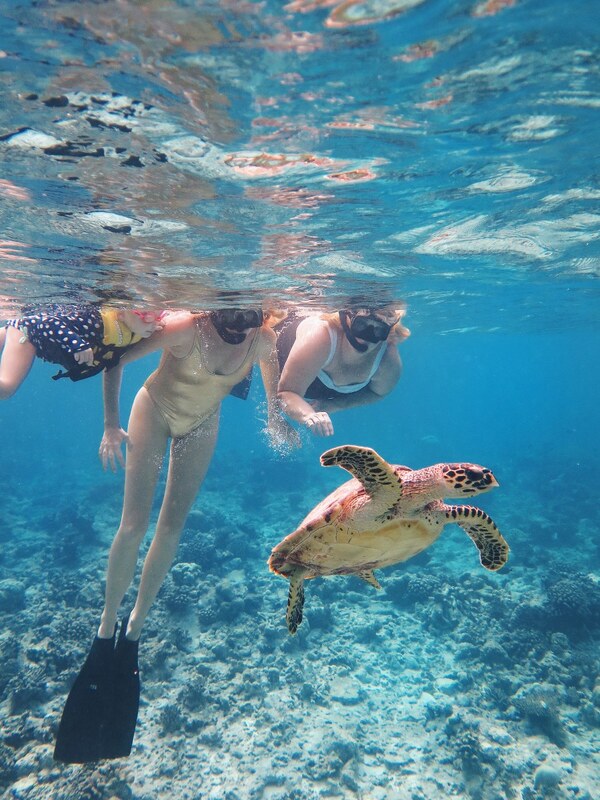 So having to overlook these fun but more strenuous activities we opted for snorkelling on a nearby reef with the promise of Turtles. I am sure parenting rule 101 instructs parents not to promise a rare animal siting to their children, but luckily for us we spotted two turtles within the first 5 minutes of the snorkel, and our 3 year old daughter in her resort provided buoyancy jacket, loved the experience. To be honest, it was probably the highlight of our trip, to hear her scream with excitement about finding Dory, Gill & Nemo. It was an incredible experience and the turtle sightings by 3 generations (3 years, 33 years and 63 years) was the icing on the cake. 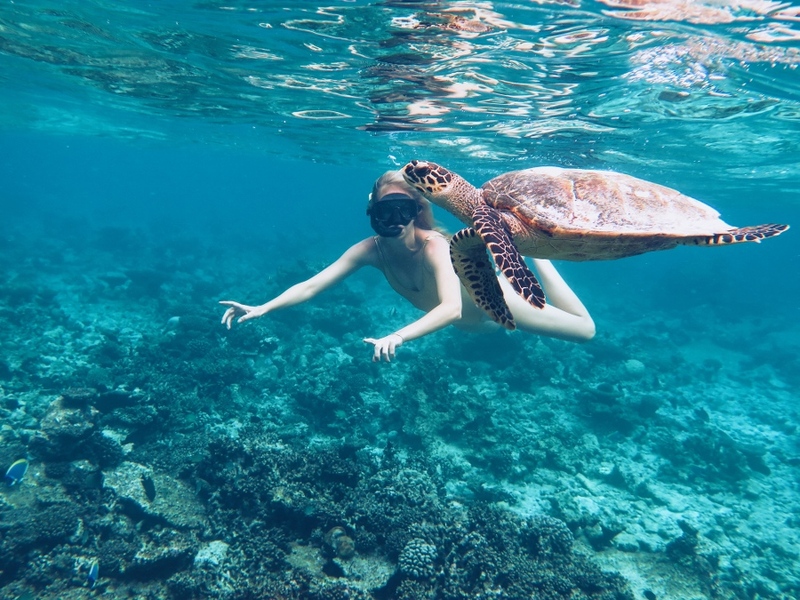 We were guided by the resort’s marine biologist Lisa who was extremely passionate about the marine life and was able to share with us the resort’s efforts in sea turtle conservation along with the Olive Ridley Project – to protect and save these incredible marine creatures. After a tiring morning of snorkelling and drying out our waterlogged bodies, we walked through the lush jungle of the island to lunch, and upon the way, our daughter spotted and collected no less than 25 hermit crabs, keeping her busy on the 2-minute walk. 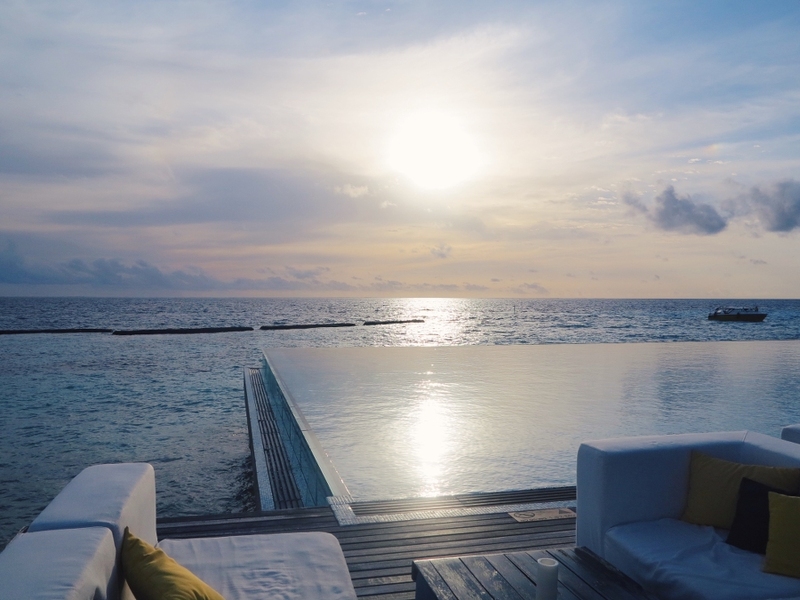 The dining area was very welcoming, not only because of the friendly staff, but the infinity pool overlooking the Indigo blue waters was breathtaking. As we opted for a casual lunch in the lounge area at LATITUDE, we got some peace and quiet as our daughter was so taken by the glass infinity pool she didn’t want to leave. The rest of the afternoon was spent lazing on what felt like our own private beach and there were lounge chairs and umbrellas already set up. We lay our 6 month old down with toys and our 3 year old had the tough choice of deciding between chasing hermit crabs, building sand castles, picking tropical flowers, following the black tip reef sharks along the sandbanks or trying to snorkel on the small reef 5 metres from the shore. Mumma and Dadda were able to relax with the sun shining and waves lapping while enjoying refreshments from the well-stocked minibar, contemplating the hard decision of where to overindulge for dinner that night. The babysitting service was fantastic. 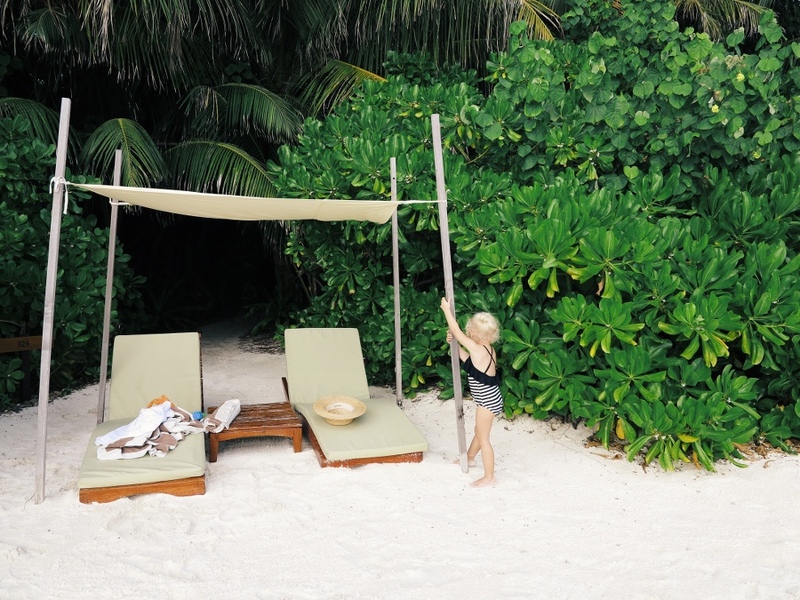 The staff were so adoring towards our kids and we felt very comfortable leaving them in their capable hands allowing us to enjoy the many restaurants and other activities on the island. The days, activities & dining experiences seamlessly flowed from one day to the next, and our stress levels decayed with each hour passing. The staff were incredible and the flexibility in their desire to please us was amazing. If you can dream it, they can deliver it. We didn’t see one guest without a smile from ear to ear. The saddest part of our time at Coco Bodu Hithi was having to say goodbye. Goodbye to the snorkelling and vibrant sea life, goodbye to the softest whitest sand we have stepped foot on, goodbye to the hermit crabs & the sand castles. Goodbye to the friendly staff and the chefs who whisked our taste buds to heaven and back with every meal. Goodbye to the masseuses who put us to sleep & goodbye to the island. 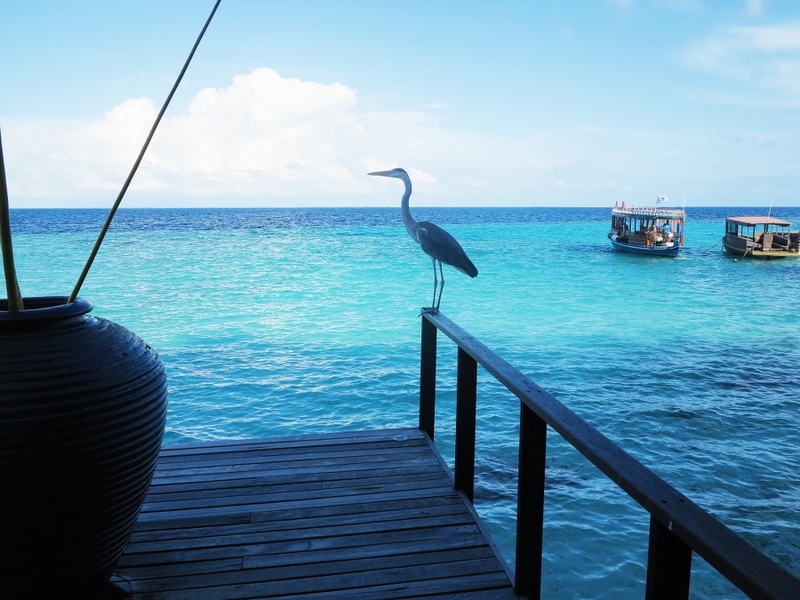 We relaxingly slumbered onto the boat and took in the island sights as we headed toward Male. Of course the staff made the transit from the island to boat to plane very easy, and we were on our way home as though it had all been a dream. 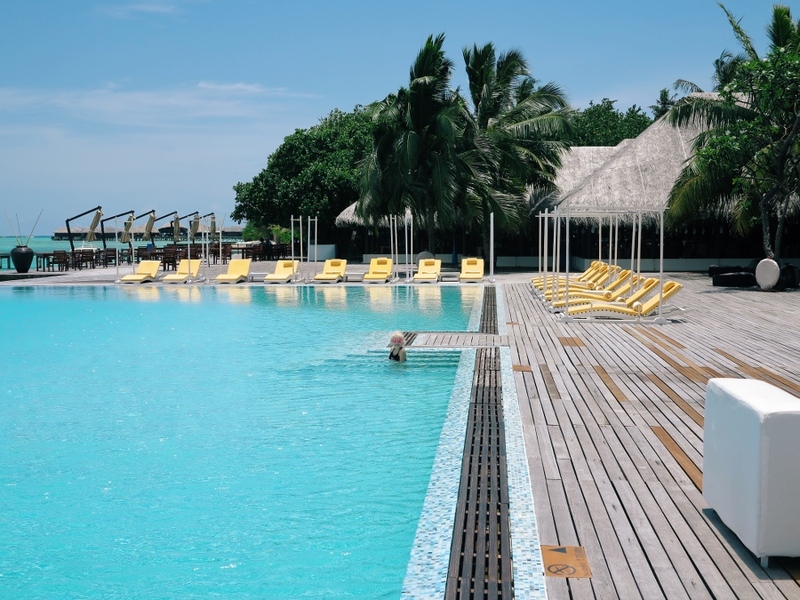 This family review of Coco Bodu Hithi Maldives was written by @kelly_beckwith and @jamesbeckwiths of The Asia Collective.